Insurance and reinsurance sector losses from hurricane Matthew are currently converging on a total impact of around $6 billion, but it is still very early to put a figure on the impact of Matthew given the large area of U.S. coastline affected. Risk modelling firm CoreLogic is the first to offer a true estimate of industry losses that will be suffered by insurance and reinsurance markets, as its analysis shows the likely range as being between $4 billion and $6 billion. CoreLogic’s estimate includes insured property losses to both residential and commercial properties, primarily due to hurricane force winds and storm surge damage. The estimate does not include insurance losses related to additional flooding, business interruption or contents, the firm explained. CoreLogic believes that 90% of the insurance and reinsurance industry loss will be related to wind and 10% storm surge. However, its important to note that this estimate was released at just before 9am ET on Saturday, at which time hurricane Matthew was still battering the Carolina’s coast and storm surge was still occurring, so the mix of wind to surge could change when later industry loss estimates emerge. CoreLogic’s analysis shows that insured losses from hurricane Matthew are expected to be “well above” Hurricanes Floyd of 1999 and David of 1979, but well below Hurricanes Katrina (2005) and Sandy (2012). CoreLogic said that it estimates 1.5 million residential and commercial properties potentially impacted by wind and storm surge from Hurricane Matthew. However, with buildings in the region primarily constructed of masonry, wood and veneers, and given Florida’s stringent building codes, total insured property losses may be reduced compared with other memorable storms. 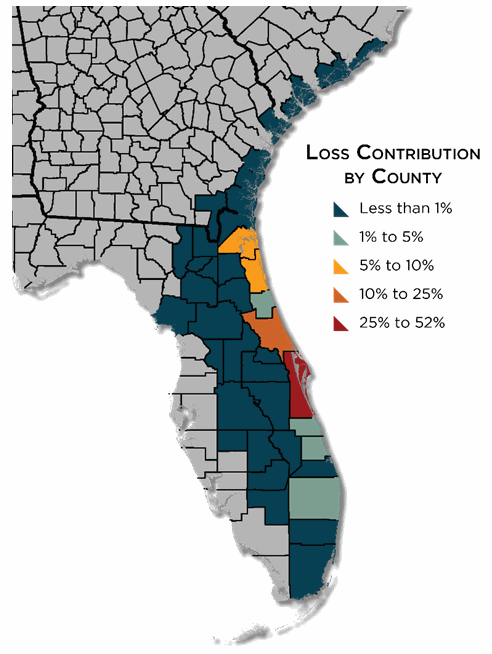 CoreLogic also provided a map showing the loss contribution by county in Florida, Georgia and South Carolina from hurricane Matthew (below). Important to note here that CoreLogic’s estimate is based on track forecast data from the October 6th 5:00 pm EDT advisory issued by the National Hurricane Center, run through its hurricane model. So uncertainty remains in this estimate and it does not include the fact that hurricane Matthew actually made landfall in South Carolina, as the forecast track at that time still kept the storm offshore. Risk modelling firm RMS said that, as of 11am UK time Saturday, its latest scenario based model runs showed that in the Caribbean the smallest modeled scenario produced a loss of under $1 billion, and the largest just over $5 billion, based on losses from wind only. For the United States, RMS came up with five modelled storm scenarios that were most similar to hurricane Matthew, which suggested a range of industry losses from $2 billion to $8 billion, again wind only. RMS said that “considerable uncertainty remains” in these modelled scenarios, and as wind only they don’t factor in surge, rainfall, flood damage that has been widespread. “It is however becoming clear that Florida at least has dodged the bullet that was heading its way on Thursday,” RMS explained. Other estimates have been put out in recent days, one of the more credible being Enki Research’s suggestion that the total economic cost of hurricane Matthew could be over $25 billion. When you factor in wind, surge, flood, rainfall, plus business interruption, reconstruction costs and other elements, it’s easy to imagine that the actual cost to the U.S. economy could be that high. On Friday, Kinetic Analysis had put the eventual insurance and reinsurance industry loss at around $4 billion. This was a significant reduction on the firms estimate on Thursday of up to $25 billion, which is a clear demonstration of the uncertainty inherent as hurricane Matthews impacts progressed and the difficulty in forecasting a loss for a storm which is a moving target. Meanwhile, reinsurance broker Aon Benfield’s risk modelling unit Impact Forecasting explained that any early insurance industry loss estimates are likely to be subject to change. “Given the expansive footprint of damage in the United States, the Bahamas, Cuba and Haiti, it is a certainty that the overall cost will be well into the billions of dollars. The likely timeframe to determine an authoritative and concrete financial loss estimate will be at least two weeks. Federal, state and local officials – along with insurance industry representatives – will need ample time to take a full assessment of the impacts incurred,” Impact Forecasting’s latest report explained. 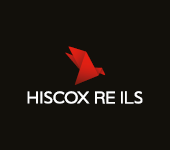 The firm also said that the majority of the insurance and reinsurance industry loss is expected to be in the U.S., given the low rate of insurance penetration in the Caribbean. At a loss of around $4 billion to $6 billion there will without doubt be losses for reinsurance companies, some ILS funds through collateralised reinsurance, perhaps some erosion to aggregate structures including catastrophe bonds as well. Whether any cat bonds could face a loss is still uncertain, but the chances of this have declined significantly and the only ones likely considered at all at risk will be those where the sponsor has significant coastal exposure and the cat bond sits low down in a reinsurance tower (so higher probability of attachment). That said, at this level of industry loss the majority of the cat bond market will certainly emerge unscathed from Matthew.